Is this Blog supposed to be available for public to follow? Perhaps these issues where addressed already. Is there some kind of consensus amongst Chabad rabonim in Eretz Yisroel about: a)How high is too high to put a mezuzah in shlish haelyon. b) When the only entrance (or entrances) to a room w/o openable windows are against heker tzir, does one put mezuzah against heker tzir? I am trying to change the term used for being magia STA"M from checking to Servicing, this would indicate that a sofer does more than just look it over, but is usually doing some hgaah as well. What would be a good term to use in hebrew instead of Bedikah? 3) Finally, I have a house that has a very unique entrance way, when you walk down the walkway there are 3 metallic "archways" which are not there for support, but more for design. 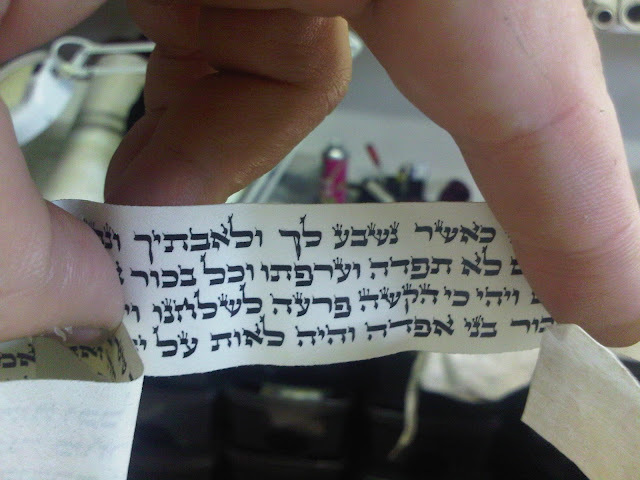 since it is in essence a mashkof and you walk through it, would they require a mezuzah? Its on the main walkway leading to the front door. A question lately came of this mem that the ink has deteriated and fell off [this is probably caused because of some chemical disorder/interaction between the klaf and dyo. In other cases it may be caused by bad conditions as to much humidity that the mezuza is exposed to] - the background of the letter is still distinct, but the dyo that is actualy intact shows a different tzura. how do we relate to this?